Two decades ago, as a young organizer in Mississippi, I learned that there are only two types of temporal power: organized people and organized money. I also learned that in a democracy, the people can win every time - but only if we are organized. Today, when I reflect back on my half-decade at the helm of the NAACP, I am deeply proud of what we have accomplished together as we organized our communities. We have abolished the death policy in five states, defended voting rights from coast to coast, freed multiple wrongfully incarcerated people, and shrunk prison systems. We have increased funding for health care, defended the rights of workers, held wayward mortgage companies accountable and curbed the school-to prison-pipeline in multiple states. We have built powerful bridges to help faith communities join the struggle for marriage equality and against the scourge of HIV, and come to the aid of our allies in the struggles for environmental protection and immigrants’ rights. Through all this, we have dramatically expanded the ranks of those who would assist us in combating racial discrimination in the streets and at the ballot box. Five years ago, the NAACP was what it had been for most of the past half century; the biggest civil rights organization in the streets. Today, we are that and also the biggest online, on mobile and at the ballot box as well. All of this success is testament to the power of our shared vision and partnership to come together for a stronger, more inclusive America. Things could have gone a different way. Since 2010, far-right wing extremists have repeatedly and simultaneously attacked the most basic civil rights protections of most Americans. They've attacked women's rights, affirmative action, workers’ rights, immigration, LGBT equality, food security, health care, and even our right to drink clean water and breathe clean air. One has to wonder whether their decision to attack all of us all at once was motivated by mere greed or by an even more devious design to ensure that we would Balkanize as we each retreated into a defensive posture. However, together, we chose the courageous path. We have marched forward arm in arm, repeatedly embracing the motto of the three musketeers: all for one, and one for all. As a result: we have passed powerful antiracial profiling legislation in New York City and even abolished the death penalty in Maryland with the help of leaders in the LGBT community; passed marriage equality bills from coast to coast with increased support from faith leaders and communities of color; and most recently we have built a powerful defense-and offense-for voting rights by pulling the entire progressive family together in ways incomparable in recent memory. Occasionally, we have even picked up new conservative friends and allies. Today, as I prepare to leave my position at the NAACP, I am confident that there is a bright future for both the Association and the larger civil and human rights struggle. We may have started this century like we started the last: fighting assaults on our voting rights and pushing back against attacks on our most basic civil and human rights. Nonetheless, this time we have a distinct advantage. We know that no matter what happens in the courts, every year our ability to defend and expand civil and human rights protections at the ballot box, in statehouses and on city councils will increase. Moreover, as organizers, we understand that while the future will come no matter what, we have the power to make the future come faster. 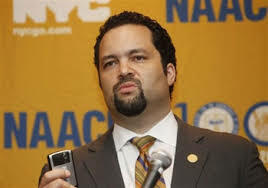 Benjamin Todd Jealous is the outgoing president and CEO of the national NAACP.